Celebrity chef kitchens are often packed with gorgeous one-use implements or machines, but most home cooks don't have the space or the budget for that kind of specializing. 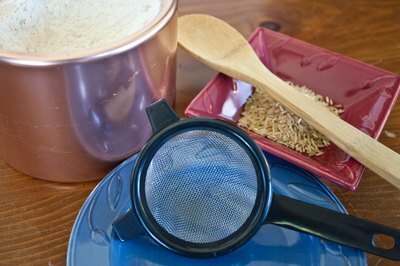 One of the simplest multi-use kitchen tools is the fine mesh sieve. This handled bowl of woven metal comes in many sizes and can be used for everything from sifting dry ingredients to pureeing foods and getting those pesky lumps out of your gravy. Many recipes call for sifted flour or for dry ingredients to be sifted together. Flour and other dry ingredients -- especially powdered sugar -- settle and become compacted during shipping, which can cause lumps. Sifting the ingredients adds air to them, resulting in fluffier and lump-free final results. 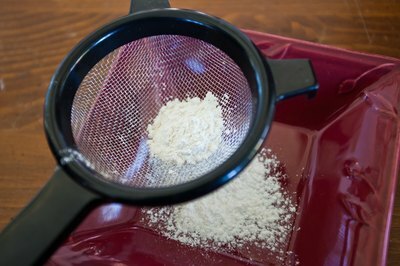 If you don't have a sifter, you can add your dry ingredients to a fine mesh sieve and then shake it gently in tiny side-to-side movements over your mixing bowl, just as if you are panning for gold. 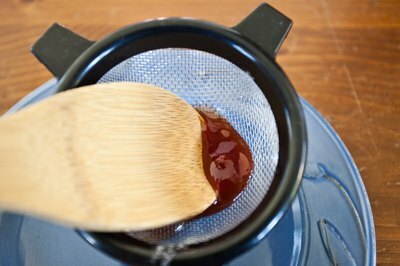 Another method is to hold the sieve in one hand and tap it gently on the side with a wooden spoon to loosen ingredients and encourage them through the sieve. Many very small foods, such as quinoa and some types of rice, need to be rinsed before you cook them, but doing so in a colander with large holes can lead to disaster. 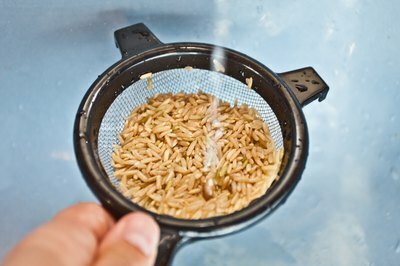 Place your grains or seeds in the fine mesh sieve and hold it under a gentle stream of water. Don't turn on the faucet full blast, or you might wash the food out of the sieve before the water can drain. Smaller holes mean that the water drains more slowly, so shake the sieve gently to help speed the process. Professional chefs and many home cooks use a type of sieve called a "chinois" to puree foods by hand or get the lumps out of gravies and sauces. A chinois resembles a fine mesh sieve, but the bowl is shaped like a cone instead of rounded on the bottom. The chef places the food to be pureed or the gravy or sauce into the chinois and holds it over a bowl while pushing the food through the mesh with a pestle or a wooden spoon. You can get the same effect with your fine mesh sieve by using the back of a wooden spoon to push foods through it and into a pot or bowl. 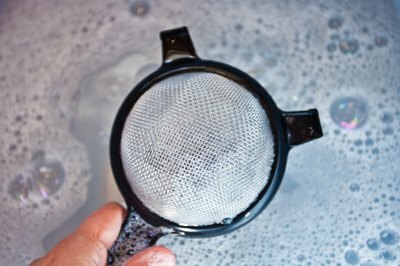 Fine mesh strainers can be a pain to clean, especially if you are using them with thick or sticky wet foods. The best way to care for a fine mesh sieve is to clean it the second you're done using it. Shake off the excess flour or other dry ingredients into the sink or your trash bin. Run the sieve under hot water, rinsing both sides well, and then wash it as you would any other kitchen implement with hot water and mild dish soap. To clean wet foods from your sieve, turn it face-down in the sink and run hot water over it. Loosen the food with a sponge and then turn the sieve over and wash the inside of its bowl. Air dry or wipe the sieve dry with a clean dish towel. Use a soft plastic brush to get at stubborn particles and then rinse the sieve thoroughly. Joy the Baker: Baking 101 -- Must We Sift This Flour? The Kitchn: What's the Best Way to Clean a Fine Mesh Sieve?